Liza Treyger is a Chicago based standup comic. 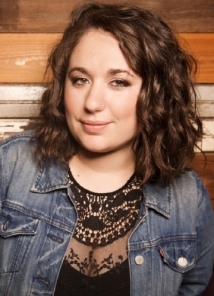 She was recently named one of Comedy Central's "Comics to Watch" at the NY Comedy Festival, where she watched comedy shows and ate cake balls with 2 professional wrestlers. She's also eaten amazing food all over the country like in the summer of 2012 at the Laugh Your Asheville Off festival in North Carolina she ate scallops, corn muffins, and went on a brewery tour. In Cleveland Liza ate rib nuggets, and tried Christmas Ale for the first time. You can all assume no matter where she is, mac n’ cheese has been eaten, including Bridgetown Comedy Festival 2012. In her lovely home of Chicago she performed at the Just for Laughs Festival and lived her teenage dream by meeting and featuring Steve-O of Jackass fame. Backstage they had a dish full of popular chocolate treats. She's featured for a lot of hot shots in comedy and has really enjoyed herself. She can't wait for another fun year full of performing with her friends, heroes, enemies, favorites, and travelling all over telling jokes, and of course eating awesome food. In March 2013 she will be representing America at the Glasgow Comedy Festival in Scotland.